Professional quality art markers at an affordable price. Designed for professionals and students working in all areas of graphic design and illustration. Versatile double-ended design produces four line widths. One end features a fine nib for sketching and detail work. The broad nib on the other end produces three line widths, and can lay down an abundance of color. The cap design prevents markers from rolling off of work surfaces. Set of 12 — A good starter set of bright, vibrant colors. Includes Black, Red, Dark Green, Canary Yellow, Ultramarine, Violet, Dark Umber, Pink, Very Berry, Orange, Bright Green, and True Blue. Packaged in a box with a plastic tray. Cool Grays, Set of 12 — Contains 12 markers, including 10%, 20%, 30%, 40%, 50%, 60%, 70%, 80%, 90%, and 3 Blacks. Packaged in a box with a plastic tray. Warm Grays, Set of 12 — Contains 12 markers, including 10%, 20%, 30%, 40%, 50%, 60%, 70%, 80%, 90%, and 3 Blacks. Packaged in a box with a plastic tray. Set of 48 — Includes Black, Cool Gray 10%, Cool Gray 50%, Dark Green, Dark Olive Green, Teal Green, Bright Green, Spring Green, Apple Green, Leaf Green, Chartreuse, Lime, Navy Blue, Ink Blue, Ultramarine, True Blue, Cerulean Blue, Light Cerulean Blue, Periwinkle, Lilac, Violet, Red, Wine, Brick Red, Very Berry, Pink, Rose Petal, Coral Pink, Salmon Pink, Canary Yellow, Light Maize, Yellow Ochre, Butter Cream, Saffron, Orange, Poppy Red, Terra Cotta, Peach, Light Peach, Antique White, Camel, Beach, Tan, Dark Brown, Caramel, Sienna, Light Umber, and Dark Umber. Packaged in a box with a plastic tray. Set of 24 — Includes Black, Cool Gray 50%, Bright Green, Dark Green, Leaf Green, Apple Green, Ink Blue, Light Cerulean Blue, True Blue, Ultramarine, Periwinkle, Violet, Red, Very Berry, Pink, Brick Red, Dark Umber, Dark Brown, Sienna, Caramel, Peach, Orange, Saffron, and Canary Yellow. Packaged in a box with a plastic tray. Set of 96 — Includes one marker in each color and a Colorless Blender. Set of 6 — This basic set contains Black, Red, Dark Green, Canary Yellow, Ultramarine, and Violet. 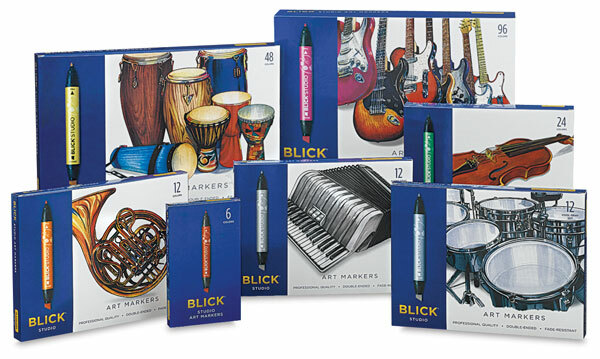 To view a PDF of Blick Markers, please click here.